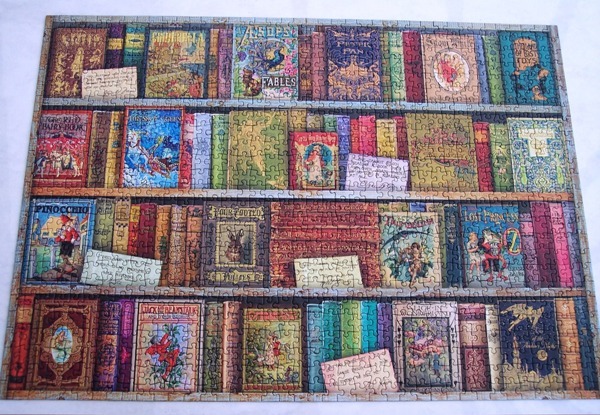 It hadn't really clicked that it was the last day of April until I saw that other people had done their April run-down of books. Tomorrow, it seems, is the 1st. of May. Goodness. Before I go any further I must apologise that I've had to turn the word verification thing back on. The spam was getting out of control again so I'll leave it on for a week or so and then see if I can turn it off. 21. 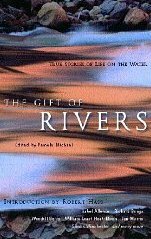 The Gift of Rivers edited by Pamela Michael. 24. 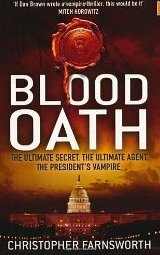 Blood Oath by Christopher Farnsworth. This one did exactly what it says on the tin. It was a face paced thriller with a vampire. For me it was a 'so-so' book. Elements of the plot were cleverly devised... the mad scientist who was making mindless, powerful soldiers from body parts of actual dead soldiers was very convincing: I found the idea very scary. I liked the idea that the President has his very own vampire to solve his terrorist problems! How cool would that be? LOL. What was weak about the book, in my opinion, was characterisation. I felt the author could have worked a bit harder on making the vampire, Nathaniel Cade, a lot more interesting. He was a tad boring to be honest and that's quite sad. Other characters were also lacking in depth, a missed opportunity, but there you go, you can't win 'em all. And it could easily be that subsequent books provide more in the way of characterisation and depth. So, five books this month. Pleased with that, as one of them was very long and could easily have taken me all month to read if I was in the middle of a slow reading period. My two favourite reads were The Glass Guardian by Linda Gillard and The Ship of Magic by Robin Hobb. Just for those two books alone I would consider this a good reading month. The background to the plot of this one is jazz music. *Not at all* my thing but a good author can make you read about things you never knew you were interested in and make you want more. Quite a talent that. At last I've finished my second book for Carl's Once Upon a Time VII fantasy book challenge. It's really no wonder it's taken me this long as this second book was 880 pages long. The length, really, of almost three books. 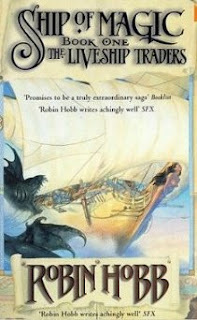 Anyway, the book is The Ship of Magic, book one of Robin Hobb's 'Liveship Trader' trilogy. Althea Vestrit is a young woman from an Old Trader family of Bingtown on The Cursed Shores. Her family have a Liveship, Vivacia, that has yet to 'quicken', ie. come alive. But the time is close. Althea's father, Ephron, lies dying at home and his death will be the third generation of Vestrits needed to quicken the ship. Althea hopes that when her father dies she will be captain of the ship and supplant the vicious Kyle Haven, her elder sister, Keffria's, husband. Things do not go according to plan. Her father is brought down to die on the ship and Althea discovers that the ship has been given to Keffria and thus Kyle remains captain. Althea is devastated as it is her that her father has been grooming to take over the ship, but in her absence he's been persuaded to change his will. However, a blood family member must remain on board to 'connect' with the ship. Althea presumes that will be her. But again she is wrong. Kyle and Keffria have brought their elder son, thirteen year old, Wintrow, home from the monastry where he was preparing to be a priest of Sa. He too is devastated as this is not what he wants. Wintrow is a quiet, sensible, steady boy, not adventurous or rowdy. He tries to reason with his parents and grandmother but none of them understand, least of all his violent father. After Elphron's death and Vivacia's quickening the family is torn assumder. Althea, completely undone by what she considers a family betrayal, walks out. Wintrow is forced against his will to sail on the ship. He's drawn to Vivacia, in the shape of the figurehead of the ship, but hated by his father and the rest of the crew. He has to grow up very quickly and learn how to survive in this adult world that nothing has prepared him for. Meanwhile things back in the Vestrit family home are going from bad to much worse. The family has lost much of its wealth due to new trader families moving to Bingtown. They bring with them the scourge of slave ownership, something the Old Traders have never approved of. Like all Liveship owners the family made a bargain with a family who live in The Rain Wild, up river, in order to get the wizardwood to build their ship. It's a dangerous, magical area, and the trader families pay a high price for their proximity to it... deformed babies etc. Debts for the ships must be paid. 'Blood or coin'. If the family cannot get together the money, the Rain Wild family will take a member of the Vestrit family. Keffria's daughter, Malta, a spoilt brat, has no idea of the danger she's in by rebelling as she does. Althea has taken off in the belief that she can turn herself into a proper sailor by sailing on a hunting ship, and thus get Vivacia back from Kyle. Wintrow is in purgatory, unable to please his father whatever he does. A pirate, Kennit, to the south of Bingtown wants to own a Liveship and make himself king of the pirates. A wrecked, 'mad' Liveship on the coast near Bingtown is attracting unwanted attention but gains a friend. And the sea serpents, once very rare, are suddenly too plentiful and, strangely, moving north. What is going on? It's been several years since I read anything by Robin Hobb and that was the last book in her 'Farseer' trilogy. The Liveship Trader books are set on the same world and connect. I'm not sure how yet but gather all will be made clear eventually. I'd forgotten what a brilliant writer she is. No author could produce a book like this and *not* be brilliant to be honest. There are so many layers, so many different points of view and plot threads to keep an eye on that you'd just have to be some kind of genius otherwise you simply couldn't do it. But it's not just that, it's that her writing is wonderful. It grips you by the throat and doesn't let up. At the end of it you feel like you've been through the mill several times: exhausted and wrung out. Because here's the thing with these books - they are not a cheerful read. If you want that, choose another author. Robin Hobb is *mean* to her characters. They suffer. The torment is almost unbearable. I have an over-sensitive reaction to injustice so at times this book was pergatory for me. I desperately wanted several people to get their come-uppance, some do but others I fear I will have to wait for subsequent books for that to happen. Which again proves the quality of Hobb's writing. Because there are no saints in these books. Althea is pig-headed and stubborn, Wintrow is actually 'saintly' but also pig-headed and never takes the straight road when a more diffcult one is available. Brashen Trell, probably my favourite character, is the subject of a 'Will they, won't they?' question all the way through with Althea, but he too is stubborn, inclined to drink too much and enjoy illicit substances. I think there was only one aspect of the story I found a bit superfluous and that's the scenes with the sea serpents. They were few and far between but didn't feel clear to me, but I fully understand that in later books they may play a much bigger role and it was not a problem. I will say too that this book is not really a stand-alone. It's quite clear the story continues on and many things are not resolved. Not that that is a problem for me as I fully intend to read on once I have my breath back. My head is so full of these characters at the moment, the world of the Bingtown Traders and the seas around them is so real that it almost feels like it must exist somewhere. To my delight I've discovered that Robin Hobb's latest four books are a continuation of this trilogy. They're called The Rain Wild Chronicles and presumably deal with the magical and dangerous area that we only get glimpses of in The Ship of Magic. I honestly can't wait and plan to continue reading through the year until I get up to date. It was down to my lovely friend and 'sis', Pat at Here, There and Everywhere that I ended up with a free copy of The Glass Guardian sent to me by its author, Linda Gillard. I knew Pat had read and reviewed The House of Silence by Linda and that she had really liked it. It sounded like a book I would enjoy too, and I made a mental note to get it at some stage, but I never expected to get a chance to read the author's latest book so soon. Wonderful. Thanks to Pat and Linda Gillard, both. In the past year Ruth Travers has experienced the deaths of three people in her immediate family. First David, her partner of two years, then her father, and then the woman she almost thought of as her mother, Aunt Janet. Ruth is a TV gardener, known to many as 'Delia of the Delphiniums'. But all these deaths occuring as they do, one after the other, have almost destroyed her, particularly that of her aunt. Thus, her career is in ruins and, in an attempt to come to terms with it all and find some peace, Ruth travels to the Isle of Skye, where Janet lived, to sort out the house she's been left in her aunt's will. The house is called, Tigh-na-Linne and featured heavily in Ruth's childhood. Janet looked after Ruth a lot and many happy holidays were spent with her loving but undemonstrative aunt. The story really begins with Ruth entering her aunt's study one evening to discover something very odd. Janet had been in life a very tidy person, a place for everything etc. Ruth finds her aunt's pen on the desk, the top off, leaking ink everywhere. Her aunt has been dead a month and would anyway never have left her belongings in that state. The other thing is that Janet's RHS gardening diary is open... at today's date. Ruth is spooked. Has someone been in the house and moved stuff around? If so she can't imagine who it could be as Janet was rather solitary in her habits. Plus, Skye is a very low crime area, break-ins are almost unknown. Ruth is perplexed. She wonders if it might be an odd-job man Janet employed and contacts him. 'Tom' when he turns up is tall and blond and very attractive. And it turns out he was Ruth's childhood friend, Tommy, when she was here in the summer holidays. The problem is Ruth doesn't think the intruder is him. What he does remind her of though, is that she had an imagined friend back then, Heckie. Ruth had completely forgotten, or blocked it out. Things begin to get really peculiar when Ruth is awoken one night by the sound one someone hauling furniture about. She investigates and finds a wardrobe on the landing has been moved. The next day she has the wardrobe shifted and behind it is a stained glass window. The shock is that it's a depiction of a man as an angel, the 'man' is Heckie. It seems James Hector (Heckie) Munro actually existed but died in WW1. Ruth's Heckie was a ghost that she was actually seeing and it's not long before he appears to Ruth again. But what does he want? In helping him Ruth has to guard against is falling in love with a 'ghost'. She also has the further complications of Tommy and the fact that he clearly wants to be more than friends, and a certain Canadian by the name of Athelstan Blake who she corresponds with by email because he wants to write a biography of her aunt, who was a bit of a composer of music at one stage. It's all very complicated and none of it is helping the decision Ruth ultimately has to make about whether to sell this beautiful house that she feels such a connection to, and get back to London to rebuild her life and career, or stay on Skye and create another kind of life for herself. Well, it's a few days since I finished The Glass Guardian and it's still there in my mind, hovering. Why? Well, it was just gorgeous for a start. I adore this kind of romantic type novel with secrets to discover, a bit of suspense, and most of all 'a ghost'. It's far more complicated than I've managed to describe. There's a diary and a lost love and the need to discover what happened. There's Tom, hints dropped along the way about him, and there's Stan and a mystery about who actually did write a piece of music that Janet was famous for. There's bereavement, grief, and guilt over her feelings about David, her partner, and the manner of his death. Difficulties too about her relationship with both her parents. I have a romantic soul so the romance was right up my street. That too was very complicated as Ruth tried to sort out her feelings for all of the men in her life. The WW1 connection with Heckie was poignant and tragic and extremely well done. There was a very clever twist which I'm not going to go into. I didn't see it coming but it was just perfect. I rather fell in love with the house, Tigh-na-Linne. A rambling old Victorian house with a stunning garden is my idea of the perfect home, and it really is a character in the book as much as Ruth or Heckie or anyone else. The garden sounded wonderful with its pond and dilapidated old bridge: when it snowed it turned into my idea of heaven! To have it on the Isle of Skye added to the pleasure for me as I have Scottish roots and have always wanted to visit that island. One day perhaps. I loved the way the author managed to bring so many separate plot elements together to create a very satisfying book. It's atmospheric, full of suspense, beautifully romantic and beautifully written. No mean feat really. 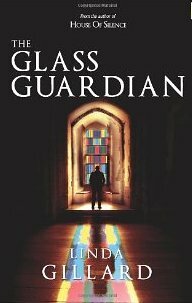 Many thanks to Linda Gillard for sending me The Glass Guardian to read and review. It hasn't influenced my opinions, I would have loved it to bits whether I had bought it, borrowed it from the library or been sent it by the author. It's gorgeous. And I will certainly now be reading Linda's other books. Can't wait to be honest. It's over a week since my last post, I still have comments to answer from that, but it's well into April so I will do my 'Books read last month' post before I do anything else at all. I will also do an update on my challenges and possibly say a word or two about what I've been reading over the last week or so. 13. The Monster Corner edited by Christopher Golden. This was an anthology of horror stories which was not bad, some very good stories, some not so good. 14. Walk the Lines by Mark Mason. An excellent non-fiction recounting how the author walked the entire London Underground 'overground'. Funny and quirky. 15. Keeping the Dead by Tess Gerritsen. Book seven of her excellent Rizzoli and Isles series. All Egyptian archaeology and mummies and thoroughly entertaining. 16. The Neon Rain by Jame Lee Burke. The first book in the author's Dave Robicheaux series set on the coast of Louisiana. Great stuff. Loved it. 17. The Rivers of London by Ben Aaronovitch. First in the author's Peter Grant series, a sort of urban fantasy. Funny and inventive. 18. The Help by Kathryn Stockett. 1960s Mississippi dealing with how black maids were treated. Simply amazing. 19. Heaven's Prisoner by James Lee Burke. Book two in the Dave Robicheaux series and every bit as good as book one. As I said, seven books in all and thus quite a good month for me despite being busy towards the end of the month. I think it might be down to the lack of good TV at the moment. It's meant we often turn the TV off and read. Of course there are exceptions to that, the new series of Foyle's War has been terrific for instance. (The war is over but he's now working for MI5.) Last of three tonight. And there are some good cooking shows on, Masterchef, The Hairy Bikers and Paul Hollywood's bread baking series. We're beautifully spoilt in the UK for cooking shows. I digress. Favourite book of the month? Without question, The Help. OK... Book challenges. We're a quarter of the way through the year so time for an update. I have Party or Celebration, Fire, Emotion and Lost or Found to go. 1. I Know Why the Caged Bird Sings by Maya Angelou. 2. The Help by Kathryn Stockett. Both of these were stunning. 1. Rivers of London by Ben Aaronovitch. My own 'Read around America' challenge is also still ongoing. It's going slowly but surely and I'll do a separate post about it soon, but at the moment I seem to be very involved with Louisiana, Montana and American rivers! So now we're into April and I've finished two books so far. 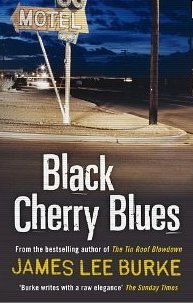 Black Cherry Blues by James Lee Burke is book three in his Dave Robicheaux series. (Why yes, I do seem to be hooked...) This one finds Dave still running his fishing business after resigning from the police. He's fairly settled, looking after his adopted daughter, Alafair, but is still haunted by his demons: his alcoholism, the death of his wife, events in the Vietnam war. Back into his life comes friend, Dixie Lee Pugh, who needs his help. Dave resists at first sensing trouble, and when he relents he certainly gets it, finding himself head suspect in a murder case. Dave discovers that the source of his problems may be in Montana and he and Alafair head off to live there for a while to try and discover who is trying to frame him for murder. This installment of the series was an excellent one. I have to say that the plots in this series are a trifle samey. Generally the head of some organised crime ring is out to get Dave. But that's fine... they're different enough to keep my attention and anyway I suspect that's not really why I'm reading them. The thing with these books is the sense of place. Burke's writing when he's describing the coastal area around New Orleans and New Iberia is beautiful. No other word for it. I've never been there but when he talks about a storm brewing in the Gulf of Mexico, or driving the roads across the swamps, or fishing on the rivers, you are *there*. And of course in this book you are also there with him in Montana, and the descriptions are every bit as good. James Lee Burke is a stunningly good descriptive and atmospheric writer and I think that answers why I'm so hooked on this terrific series. Oh and I even picked up a book rec from this story - Of Love and Dust by Ernest J. Gaines which takes place on a plantation in Louisiana in the 1940s. My second book for April is actually one I've been reading for a few weeks now and it's The Gift of Rivers edited by Pamela Michael. This one does what it says on the tin... it's a book about rivers and what they mean to various authors. Hard to review this, partly because I've been reading it so long but also each story is more about atmosphere rather than concrete experience, but it's none the worse for that. About half deal with American rivers, the Mississippi, the Missouri, the Kentucky, the Arkansas, the Colorado, and so on and that's fine with me as I have an interest in the USA. Others that have sections are the Ganges, the Nile, the Congo, the Amazon, and many more. My favourite was Rebecca Lawton's 'Headwater' about the Missouri. She included a lot about Lewis and Clark's travels and I found that fascinating... I must, at some stage, read a proper account of their journeys as I've only read bits and pieces. I also enjoyed 'Northwest Passage' by David James Duncan, about his boyhood on the Columbia river, and 'A Room on a River' by well-known travel writer, Jan Morris, about the Nile. (And she's another travel writer I really must get to one of these days.) I did plan to put this in the charity shop box when I'd finished as I only paid 80p for it from a charity shop. But I find I can't. I want to keep it, partly to reread it at some stage but also... it has the most brilliant 'recommended reading' list at the back, listing hundreds of travel books that are about, or involve, rivers. It stays on my travel book shelf. So, onwards and upwards into April. 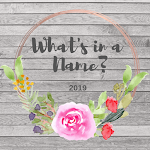 I want to read more for the Once Upon a Time challenge, more Dave Robicheaux books, The Glass Guardian by Linda Gillard, This House of Sky by Ivan Doig, about Montana, and maybe read Mark Twain's book about the Mississippi. How much of that will actually happen remains to be seen. Not as much as I would like I suspect... but it's good to have reading goals. Happy reading.